Jordan's hospitality career began at the University of Wisconsin campus watering hole Johnny O's where he worked "in every imaginable role, from bouncer to bartender to manager," while studying for his International Studies degree. "Over those four years, the hospitality industry became my passion." Having learned the basics of managing a high-volume, high-stress environment, Jordan was ready to refine his skills, and took the position of bar manager at Fresco in the spring of 2011. 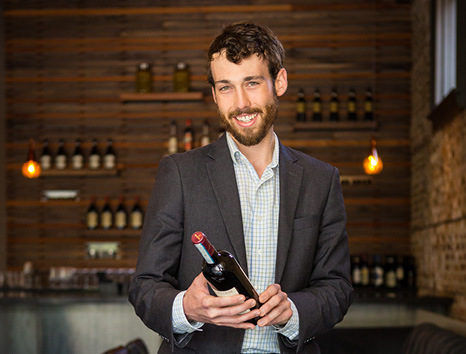 There he furthered his wine knowledge, created a craft cocktail menu, and was offered the opportunity to expand his role to include managing the front of the house. In August 2014, he was tapped to open Food Fight's modern Italian trattoria, Cento, as the assistant general manager. He was promoted to General Manager less than a year later. Food Fight's focus on introducing new restaurants to the Madison area is a big part of what keeps Jordan with the company: "The uniqueness of each restaurant shows Food Fight's eagerness to provide new and exciting experiences that Madison may have previously been lacking." The award-winning Cento has proved an ideal place for Jordan to express his hospitality mission: "to create an experience for guests when everything-the company, service, ambiance, food and drinks-is working in harmony to create a moment that transcends the individual elements." In addition, the unique culture of restaurants keeps him engaged and excited to come to work: "On paper, a restaurant staff would appear to be a haphazard collection of individuals, all with different backgrounds and skill sets. However, the shared experience and common passion creates a distinct camaraderie that binds a restaurant together. That unique connection, as far as I can tell, is not duplicated in any other industry."